Bring your look to the beach or poolside with our exclusive Custom Swimming Trunks. Personalized swimwear is the perfect way to help you show off your designs in a truly unique way and these custom made trunks have been created to help you look and feel your best. 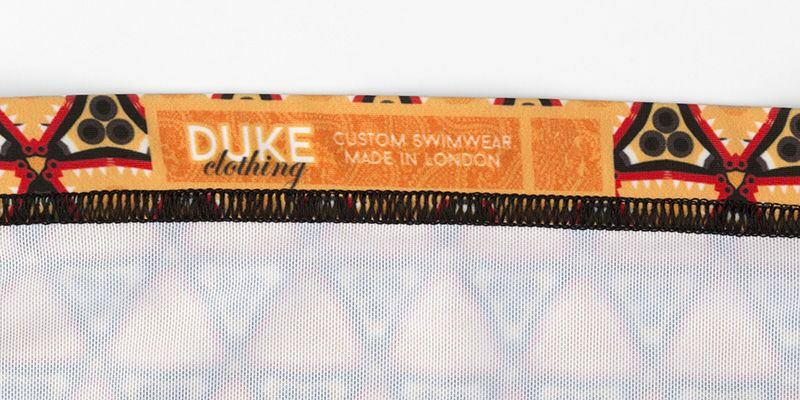 A beautifully made pair of all over print cut and sew swimming trunks, made by hand, sweatshop free. Choose from 3 of our gorgeous Lycra fabrics and design your own swimming trunks with Contrado. Whether you are looking to design a line of customized swimwear or create a pair of personalized swimming trunks for your own use, our Custom Trunks will fit the bill perfectly. Printing on Lycra fabric, these fully lined swimming trunks are form-fitting, comfortable, stylish and personalized all in one! Choose from our smooth Slinky Matte Lycra or slightly shimmery Lycra Soft Sheen fabrics to create your dream swimwear. Our bespoke swimming trunks can be made in all sizes ranging from XS up to 4XL, including plus size swimming trunks - no need to compromise style and comfort for size. This form-fitting Lycra fabric is perfect for creating customized swimwear and sportswear. It is very supportive yet comfortable and retains very little water. It also dries quickly and evenly and prints like a dream. Colors and detailing are represented perfectly. This Lycra material is another great choice for personalized swimming trunks. It is not quite as supportive as Slinky Matte Lycra but it has a beautiful shimmering face, which makes designs really stand out and gives them a bit more of a fashion edge. Design your perfect pair of swimming trunks online with us. It is simple and fun to do and within a couple of days, you could be wearing your very own pair of custom made swimming trunks. 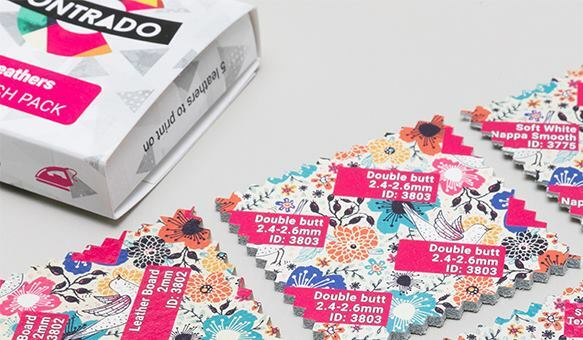 We print your designs deep into the fabric, creating a stunning, crisp and permanent print, which won't fade. Want to build your Fashion brand? 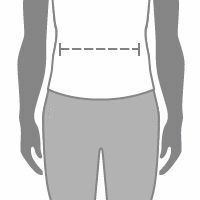 Then add your label to your Swimming trunks, and have your brand name or logo added to the finished garment. These labels are printed directly onto the Lycra fabric, giving you great full-color print quality and preventing any uncomfortable itching. And since each label is as unique as the trunks it’s printed on, you can add a name or even a personalized message for your recipient. If you want to take your own Custom Made Swimming trunks from the pool to the bar, then style it up with our Customized T-Shirt and our Custom Made Baseball Cap. 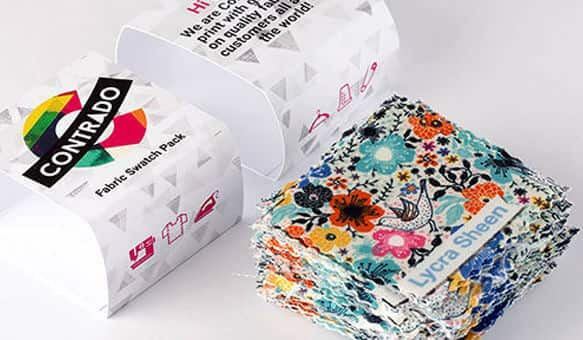 This will take your personalized swimming trunks to a whole new level, as you are turning them from a piece of swimwear to a piece of your everyday summer wardrobe. These swimming trunks are truly versatile and will look just as great walking down the street as they do walking down the beach. Custom Swimwear The product was well made and they were very helpful in helping me make sure the product was just what I wanted. Excellent work and great material. Super The quality of the material is excellent. Greatly made and superior customer here. The team worked very hard to make my design the best it could be. I am so eager to give this to my friend! He loves being different and loves being the center of attention so I cannot imagine he woldn't love what I made him! Do the trunks dry well? Our Slinky Lycra fabric retains very little water, making them ideal for customized swimwear. After submerging in water, simply hang your personalized swimming trunks flat, in the sun if possible, and they should dry completely within an hour. Are the swimming trunks form-fitting? Made from Lycra, these unique swimming trunks fit comfortably and snugly around the thighs and waist. However, they are not quite as fitted nor revealing as swimming briefs or Speedos. The net lining gives the trunks a solid, opaque finish and a soft additional layer. Do you have any other men's swimwear? Our team of designers and fashion technicians are currently working on expanding our men's swimwear collection. We should soon be unveiling our customizable Board Shorts, which will have a more casual and relaxed fit than the swimming trunks. 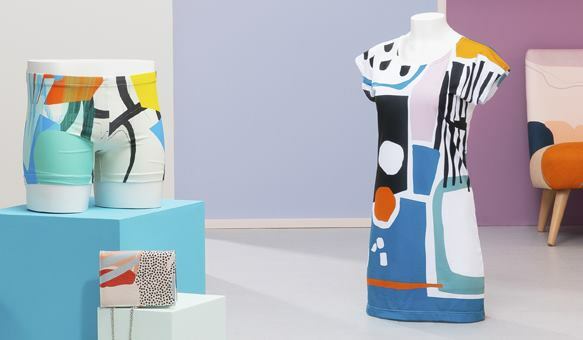 Browse swimming trunks in our curated marketplace, designed by independent artists and illustrators. Swimming Trunks "Clouds in Aspic"
Our Men's Swimming Trunks are designed to be a tight fit, especially in the Slinky Lycra. The Lycra Sheen does have more stretch allowing for a slightly looser fit and more movement. Our model Wofai is 6'1" with a 29in waist and wears a size Small.